MultiGas™ 2030 CEM-Cert is an FTIR-based gas analyzer designed for integration with complete continuous emissions monitoring systems (CEMS) to measure emissions from stationary sources such as waste incinerators, power plants and cement kilns. This FTIR analyzer is the core technology used in the TÜV and MCERTS certified MGS300 Certified FTIR-based Continuous Emissions Monitoring System (CEMS) from MKS Instruments. MultiGas™ 2030 CEM-Cert can directly analyze hot, wet effluent gas streams without sample pre-treatment. With high resolution FTIR technology (0.5 cm-1), MultiGas™ 2030 CEM-Cert can monitor multiple gas components over a wide range of compositions with minimal cross-interference effects from either water (up to 40%) or other potentially interfering species. 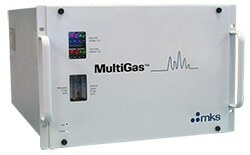 Using MultiGas™ 2030 CEM-Cert permanently-stored internal reference calibration spectra, the need for costly calibration gas mixtures is all but eliminated.